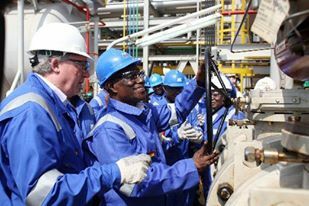 With Ghana emerging as an oil giant as a result of the discovery of oil in commercial quantities, many oil and gas service providers have taken positions in the country to meet up with the demands of this industry. CAPE 3 SERVICES LTD, an oil field service provider in Ghana, has taken a strong lead in the provision of services to oil operators and contractors in the country. Beside Ghana, the company has branches in Liberia, La Cote d’Ivoire and Togo, in addition to partners in the USA, UK, France, China, South Africa, UAE, among others, making it well endowed in the oil and gas business. They provide and manage human resource for oil giants like ENI, MI SWACO, SCHLUMBERGER…., etc. Client satisfaction is our obsession’ this is enough to inform clients and prospective ones that they are in safe hands when they leave it all in the hands of CAPE3 experts. In the area of procurement, one can trust CAPE 3 Services Ltd to satisfy their needs. Export Purchase Regrouping, International Sourcing, External Purchase of Non Strategic Material and E-Procurement are among the numerous procurement services one can fully rely on the Company to provide without sweat because they have the expertise and experience that have been proven over the years. Men, Roustabout, Marine Mechanics, Motor men, engineers for oil drilling companies that require such personnel to handle their extraction activities. CAPE 3 is a strategic partner in filling the gaps of changing roles in human resource in companies and continues to develop a strong human resource base that is tailored for their specific needs. Outside the oil and gas industry, CAPE 3 offers other logistical services for individuals and groups in many areas of human activity. VIP Support Services, urgent visa on arrival, Visa Extension, work permit and resident permit for workers and relations and other arrival and departure services at the airport form part of the numerous services they offer. With the 4 years experience in the logistics area, Cape3 decides to venture in the engineering and construction area as well by developing JV relations with other international oil and gas engineering and manufacturer companies. Cape3 is now gaining expertise in the filtration, separation and contamination areas. Commitment to Quality, Health, Safety and Environment (QHSE) constitutes the driving force of CAPE3 in their quest to meet the satisfaction target of their clientele. For those who want to procure products of any kind, especially in the oil and gas industry they can rely on CAPE3 who have rich procurement expertise and specialists and E-procurement systems to handle such needs.